On the relatively rare occasions that golfers can be distracted from discussing their own games, they can be heard debating the merits of those who are the undisputed champions of the sport. It’s not easy to reach complete consensus on this issue, given the different decades in which these masters of golf were in their prime, the variations in equipment they used and course conditions they faced, as well as the variety of competitors they beat. Any such debates frequently bog down in trying to develop a common ground for comparison. To help eliminate that little problem, I can warmly recommend David Mackintosh’s new book, Golf’s Greatest Eighteen (Contemporary Books, $24.95 SRP). In addition to its eighteen mini-biographies, the book uses a statistical model that relies on far more than recalculations of present-day money values. The “New Money” calculation by Joey Kaney also assesses a value based on the strength of competition and the value placed on particular tournaments by the contemporary golfers. For example, in its early decades the Western Open was considered a major event, long before anyone suggested the modern notion of majors that is accepted today. There’s the additional problem of assessing golfers whose competitive careers aren’t expected to be completed for several more decades, such as Tiger Woods. Accordingly, in designating the greatest 18 golfers for this book, Mackintosh also resorted to a time-honored literary device—it’s his book, and he’ll include in it whoever he wants. All that really means is that someone else could then debate the relative merits of Mackintosh’s selections. In this case, however, one would be hard-pressed to challenge the group he put together, enhanced by the golf writers Mackintosh recruited to write these combination biographies/arguments. Any collection of golf’s greatest eighteen that includes Nicklaus, Palmer, Player, Hogan, Snead, Nelson, Hagen, Sarazen, and Jones certainly touches upon the indisputable leading golfers of all time. As for some of the other selections, there may be a few quibbles, but the arguments made by the writers for each candidate are well-presented. To my mind, the New Money calculations are interesting, but don’t really carry the day in convincing me which golfers were among the best the sport has ever seen. Instead, there are other indicators, as highlighted in the biographies that make up most of the book. There are few sports figures who present such interesting character studies as Ben Hogan and Bobby Jones, for example. In Hogan’s case, there must always be some consideration to the perennial “what if” question, because of the horrific car accident he suffered just as he completed a remarkable tournament season nearly the equal of his former caddie-shack companion, Byron Nelson. A similar “what if” question surrounds the debate over Bobby Jones’ career, which he voluntarily shortened. For that matter, Nelson’s decision to leave the field when he did for the farm he bought with his winnings will always make some readers wonder what else he could have accomplished on the tour. 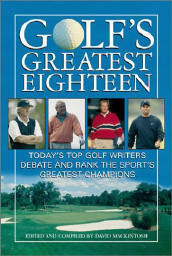 In addition, the book reminds golfers of some good candidates whose careers were not only long, but highly accomplished. Unfortunately, for the sake of their own posterity golfers such as Billy Casper had the misfortune to play when Palmer and Nicklaus were the media darlings. This book may help keep the memory of Casper’s abilities fresh; or, for some younger readers, it will provide a welcome introduction to a golfer whose exploits they should know better.